Sandy owner of Organize with Sandy was kind enough to send me a Pouchee to review. I feel in love with it from day one. 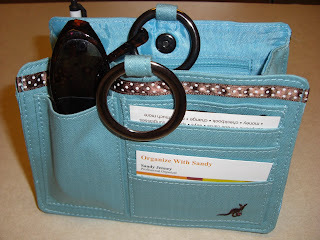 From their Site: Organizing your purse can be easy with our new Pouchee Purse Organizer! Are you always hunting for your glasses, can't find your lipstick, have to dig for your check book? Now those days are over! You can find all your essentials as easy as 1-2-3 ! 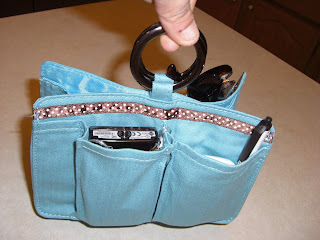 Changing purses is not longer a hassle! 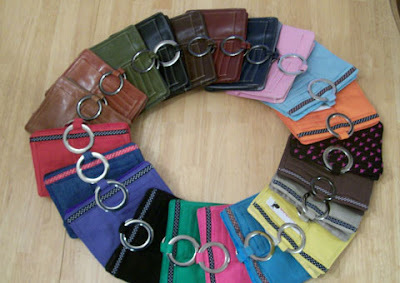 You can change purses with every change of outfits - without a problem! You simply pick up your Pouchee that is loaded with all your essentials and place it into your other purse, or diaper bag, beach bag or travel tote. No more worrying that you are going to miss transferring something you will really need!! 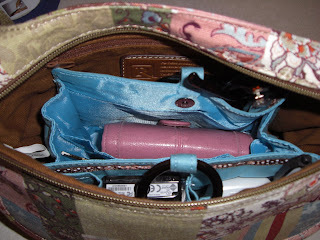 It holds everything in my purse and it makes everything so easy to find. 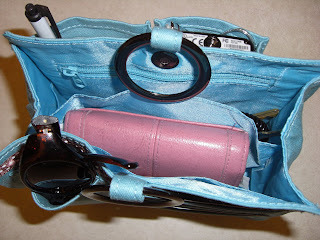 I like to change purses often and the nice thing about the Pouchee is that I grab the handles pull it out and put in another purse and I am ready to go. Here are some photos of it holding everything I carry in my purse and it in my purse. The Pouchee's are made of cotton or leatherette and comes in many different colors. The price is very affordable at $21.50 for cotton / $22.50 for leatherette. The Pouchee would make a great gift for any woman or young lady you need to buy for. Thanks for the nice review! I am glad you like it..I love mine! I really love the Buxton Organizer! I got mine at HarrietCarter.com .